You guys wouldn't know it because I've had posts scheduled in advance, but I've been really sick for a bit now. Why does this make any difference to you, since you're getting posts anyway? 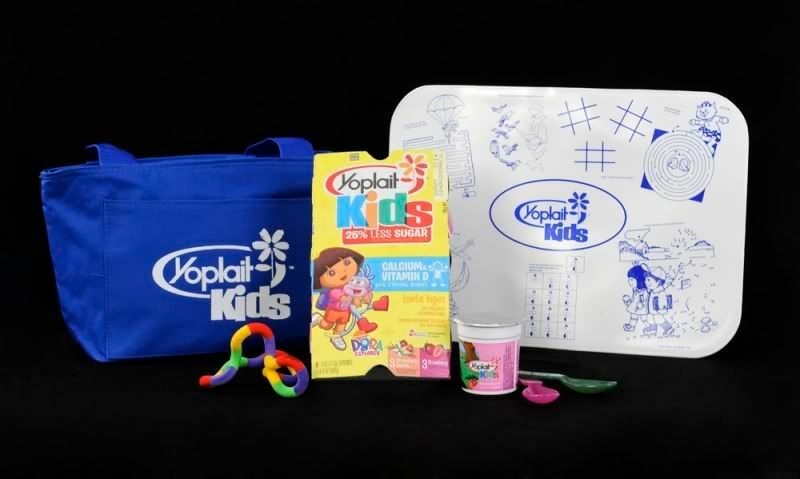 Because I got my Yoplait fun pack a few weeks ago and I'm just now getting the giveaway put up. Yikes! I'm sorry. Again, heh. Let's just get to the giveaway. As usual, lots of ways to enter, so take advantage. The yogurt is really good, even if you don't have kids to share it with, and I've already used the lunch box. MyBlogSpark is letting me give away two of these prize packs, so your odds are even higher. Woo. Contest ends at midnight EST, November 20. Sponsored by MyBlogspark and Yoplait Less Sugar More Fun. I'm not entering but I just wanted to say that I'm really sorry you've been sick. I had no idea. I hope you're a lot better now. I'm really sorry to hear that, Jessi. What's scary is that I didn't even know, because of your scheduled posts. I hope you recover quickly. I want to give you lots of helpful advice but I'm sure you don't need it! It's just I'd like to think I could make a difference to the speed of your recovery and of course I can't. What a great prize pack! I am subscribed by email. I commented on Country Flags Made Out Of Food. My favorite flavor is vanilla. My favorite after school snack was my mom's home made cookies. They were the best! Kids will definitely like that. Seems very useful. favorite after school snack is chocolate chip cookies! I just found your blog. Thanks for the great giveaway! My favorite? Probably any cheesecake flavour, specifically strawberry! I always enjoyed popcorn as an after-school snack!